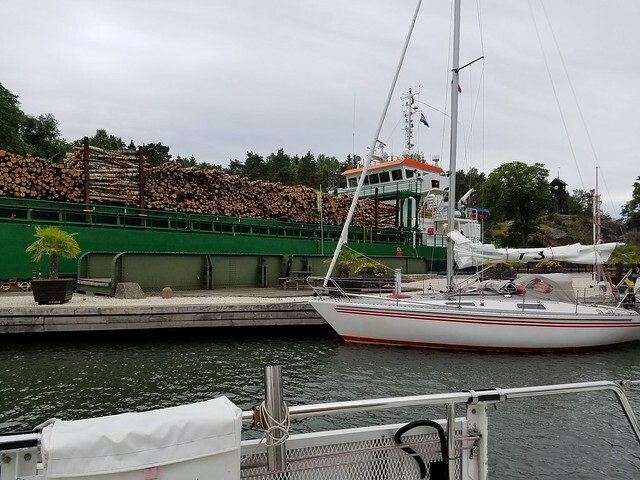 When we first arrived at Motala, the only tie-up available was along the rock quay at the south side of the marina (Gästhamn). 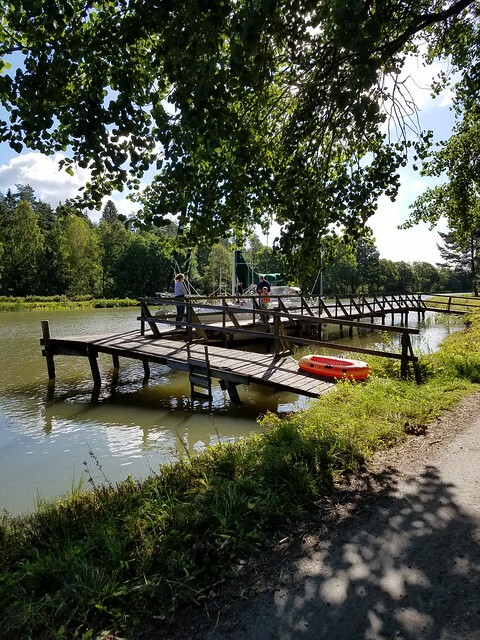 On the plus side, there was a children's playground right there; on the negative side, it was a LONG WALK to the Gästhamn services (showers, toilets, laundry, various restaurants). Above: The Motala guest harbor. Sequoia is against the sea wall on the left - note the green cover on the jib furlers. We were probably the only boat in Scandinavia with green canvas. Cori decided it was an evening for laundry, and she hiked over to the laundry room carrying laundry from all four of us (!) and getting it all into the dryers before midnight. Early the next morning I did the hike to finish the laundry off, and found it to be still quite wet. These European dryers: quite high-tech I guess ("Ekologisk") but they are not vented to the outside. Since the building's fan system was out of order, the laundry room was a real sauna! I am gradually learning about the needs of these machines: in addition to the usual lint filter, there is a condenser and a tank, all three of which have to be emptied after each load. When I first arrived that morning, there was over a quart of water in the tank, all of which suggests that maybe these washers aren't very good with their spin cycle???? 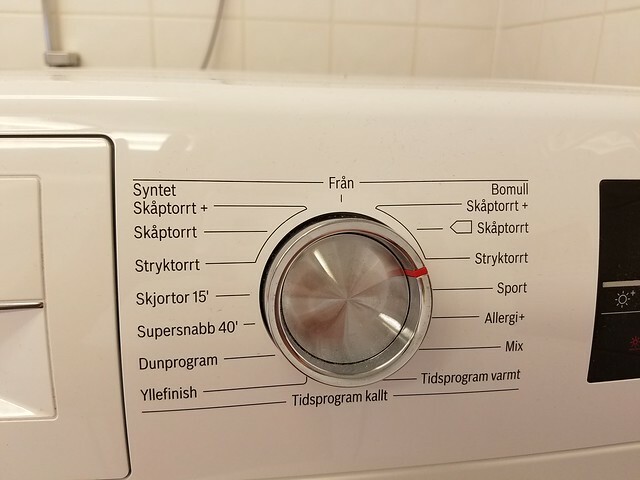 Then there is the dryer dial, with various choices in Swedish, including such things as Skjortor 15 and Supersnabb 40. I did my best with my "Google Translate" app, but it doesn't include words like these. Later that morning, as some of the boats in the Gästhamn moved on, space opened up for us, and we moved the boat to the north side of the harbor. This put Finn in close proximity to a German boat (Fräulein Smilla) with children aboard. The kids were rowing around the harbor in their dinghy, and Finn was quick to join them. They rowed across the channel to where the playground equipment was, spent some time there, and rowed back and forth several time. Finally one of the Canal employees came over and told them they were endangering themselves and others with the Canal traffic going through the area, and needed to quit their dinghy play. They moved ashore, deployed little nets to catch small fish, and explored the area. 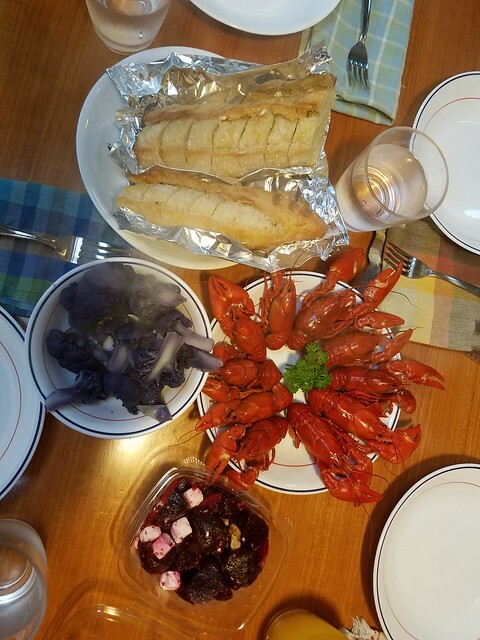 This was "crayfish week" in Motala, and Cori told us about the wild crayfish week parties she had seen in Stockholm when she was a student there. Partying like that was not our choice, but we did buy some crayfish at the local market and had a nice dinner. The evening was topped off with a viewing of Wall-E, an animated movie with very little language, so equally entertaining for Finn (who, at age 6, has not much English yet). The next morning we headed west across Lake Vättern to Karlsborg. Lake Vättern is the first of two big central-Sweden lakes. Motala to Karlsborg is a short-distance passage (17 nautical miles), unlike the Lake Vänern passage, 64 nautical miles (an all-day trip). 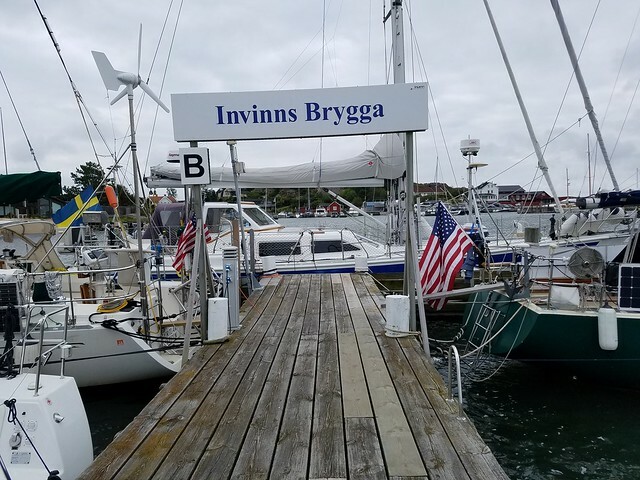 We arrived in Karlsborg in the early afternoon, and were able to get a side-tie berth. Later that day, Fräulein Smilla arrived and Finn was able to have another play session with the German kids. We invited the family over for a potluck dinner that evening. Cori went to the store with my ingredient list for enchiladas, and we were able to put together a nice dinner, with the table folded down to banquet mode. Lots of good conversation and a fun time for the kids. The refrigerator/freezer has been getting crankier and crankier, with the necessity for Craig to do a lot of mechanical and electrical tweaking to make it continue on. We knew that some replacement parts had arrived in Göteborg, so we decided that I would take the train there the next day while Craig & Cori took the boat to the next stop beyond. That decision made it necessary that both stops be convenient to a bus or train line, making a one-day round trip to Göteborg relatively easy. We picked Vassbacken for the first stop after Karlsborg, which (according to Google maps) appeared to have an early morning bus connection to the train in Töreboda on the main north-south line. On the way to Vassbacken, we passed through the highest altitude lock of the Canal at Forsvik. Forsvik was the last lock we would pass through which would take us up in elevation. After that it would be all downhill. Cori had walked ahead to have a look at the lock. She came back and warned us that the walls of the lock were not smooth stone like all previous locks. Instead, the walls were native stone, with sharp protruberances--potentially very damaging to the boat if we didn't have all the fenders positioned correctly. This lock had been blasted through with dynamite, whereas (apparently) all the previous locks had simply been dug down with picks and shovels and then lined with granite blocks. We made it through the Forsvik lock satisfactorily, and there followed a narrow section of the canal through an alpine wilderness. This could have been a stream in the Cascades, with beautiful forests all around, an occasional patch of blooming heather, birch trees and an occasional hawk. Every so often there was a wide spot designated for boats coming in opposite directions to pass each other. Before long we entered Lake Viken, which reminded us both of Echo Lake in the Sierras. The difference was that the channel through the lake was often bordered by wide rock walls - a former tow path for horses to take barges through the lake. We were both really taken by the beauty in this spot. There have been many beautiful stretches in the Göta Canal, but this one really tops them all. If we were ever tempted to have a summer house in Sweden, this might be where we'd look. We stopped for the night at Vassbacken as planned. 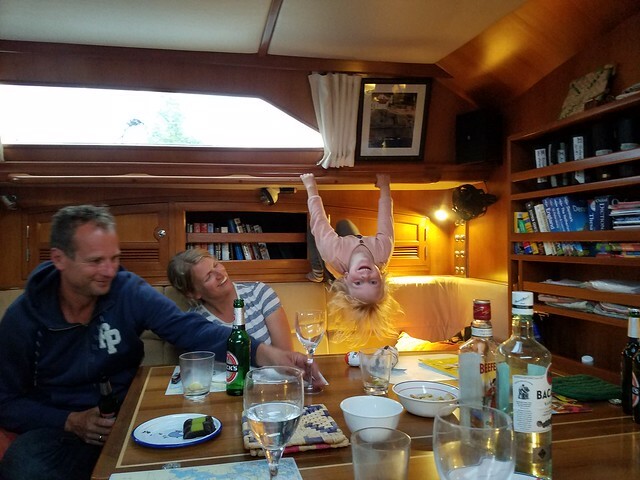 Finn was thrilled when the little dog, Tuffay, showed up on his boat (actually Lennart & Linnea's boat, but who counts the adults when you're a little kid...?) Then a bit later, Fräulein Smilla with Finn's German-speaking friends arrived and Finn's joy was complete. That evening we joined up with a group of people trapping crayfish in the canal. They were having a good success and planned a big feast for the next night. They very kindly gave us a few cooked crayfish the next morning, which we enjoyed very much that evening. (See photo of Finn with those crayfish at the top of this post -- Thanks to Cornelia Kosyna for letting me use this image). I had discovered with some dismay that Google Maps hadn't distinguished between Sunday and weekdays. The bus I thought I was going to catch to Töreboda didn't actually come on Sundays. We scrambled around and found a fellow who was willing to drive me there in the morning, and I successfully caught the train to Göteborg. Tina and daughter Emily were waiting for me with all the boat parts, and we had a nice lunch together at the botanical garden near the train station. It was nice catching up with the Olsson family's move back to Sweden from Saudi Arabia. Such an interesting life they lead! Tina helped me negotiate the Swedish Railway's customer service system and get refunds for the three extra tickets I had managed to purchase in error when the boat computer (and then the phone app) had choked the previous night. I returned north by train, arriving in Lyrestad, as planned, at about 5 pm. Sequoia had just pulled in there. Craig and Cori had some horrifying stories about what had transpired since leaving Vassbacken that morning. The winds were quite strong and gusty, and with only two able-bodied adults aboard, they were unable to control the boat as it entered one of the locks, intending to tie up to the port wall. 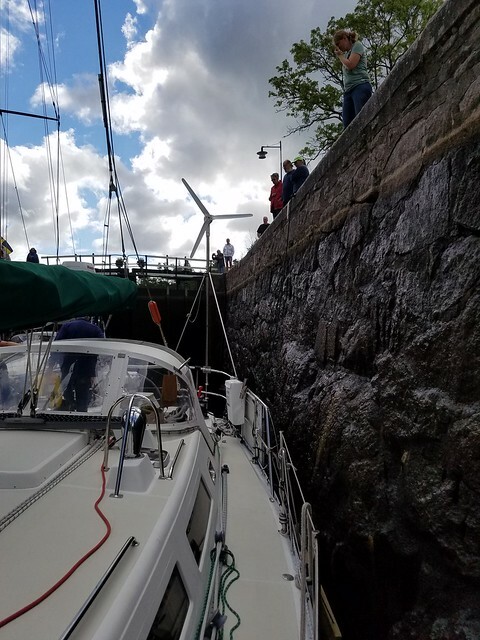 Despite their efforts, and the efforts of several people ashore, the boat blew across the lock and slammed into the rock wall on the starboard side. All the fenders were deployed on the port side, so our starboard hull now has more battle scars than it did before. Below: Finn's doggie friend, Tuffay, and Tuffay's people, Lennart and Linnea. Photo by Cornelia Kosyna, used by permission. I'm quite glad I was not there to witness these events, although perhaps I could have made a difference? More hands? Not surprisingly, Craig and Cori were exhausted and after our dinner of crayfish, we all went off to bed. Cori and Finn had planned to finish their time with us the next day at Lyrestad, taking the same train south to Göteborg that I had taken north. 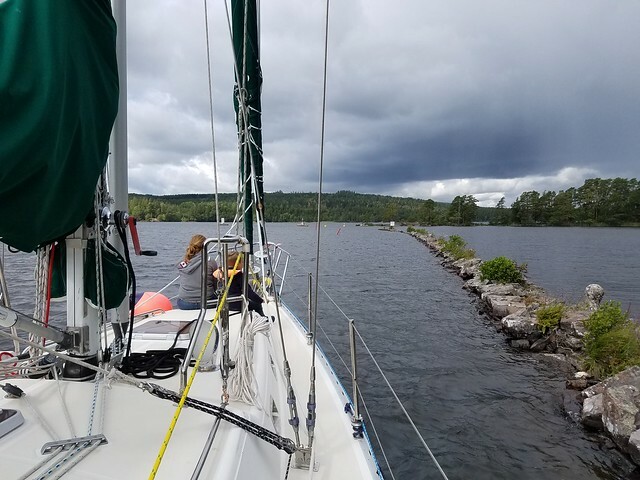 But after consideration of the day's difficulties and the forecast for more strong winds, Cori decided to stay with us to the end of the canal at Sjötorp. We were very grateful that she had the flexibility to change their trip and help us out for that last bit. Cori is, without a doubt, far stronger and more flexible than I am, and we have been very grateful for her help. As we continued west from Lyrestad, the day was windy, but not as bad as the previous day. One of the lessons learned is that locks situated in valleys or forests are generally out of the wind, but locks in flat agricultural areas can have strong side winds affecting the handling of boats in locks. It appeared that most of the locks that day would be protected by forests. (During this trip we have made a lot of use of Google Earth, or satellite view, as well as Google images, to get a sense of what a place looks like before we get there. Now we were using it to scope out the forests and fields adjacent to locks.) We navigated several locks successfully, but we also had to wait about an hour for traffic coming the other way. It was a good chance to wander along the tow path, notice the wildflowers and ripening berries, and see a few charming Swedish summer homes, as well as watch some other poor fools navigate the locks. Above: waiting for traffic as Sequoia nears Sjötorp. 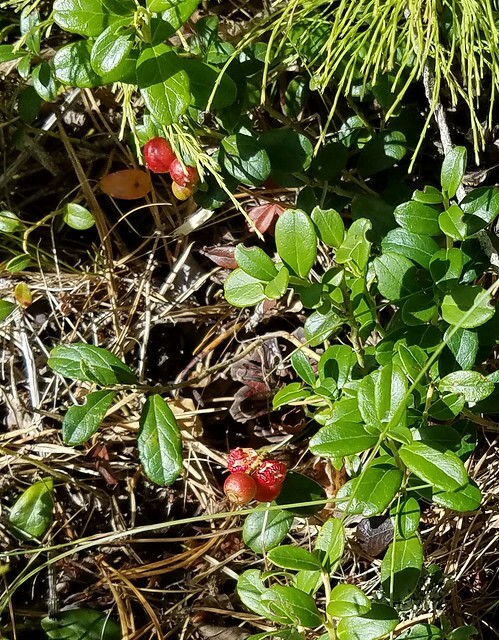 Below: Lingonberries alongside the tow path. We arrived at Sjötorp without incident, had a nice lunch together, and then saw Cori and Finn off on the bus for a long journey home to Prague. Craig and I decided to continue on out of the Göta canal and into Lake Vänern, finding an anchorage for the night. Thus we could get an early start on the 64 miles across the lake to the entrance of the Trollhätte Canal. The last lock was very windy, so I got a taste of Craig and Cori's experiences of the previous day. 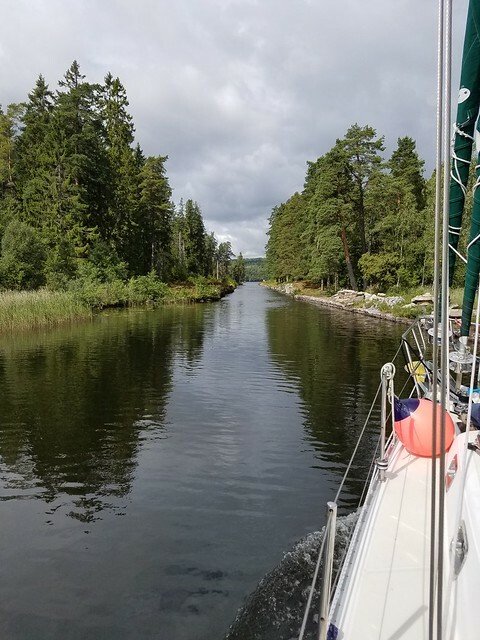 But we made it, without damage and headed to the island of Torsö, where we were able to find an anchorage for the night. As much as I have loved the passage through the Göta canal, I felt a real sense of liberation to be in open water again. I have often said that the scariest part of sailing is the docking. In terms of boat maneuvering, we had just completed 58 locks, and each involved at least one docking. So in retrospect, it's no surprise to find that open water was liberating. There is a group of islands in Lake Vänern, just a few miles from Sjötorp. We found an anchorage there and spent a quiet evening doing boat chores, reading and just enjoying the solitude. 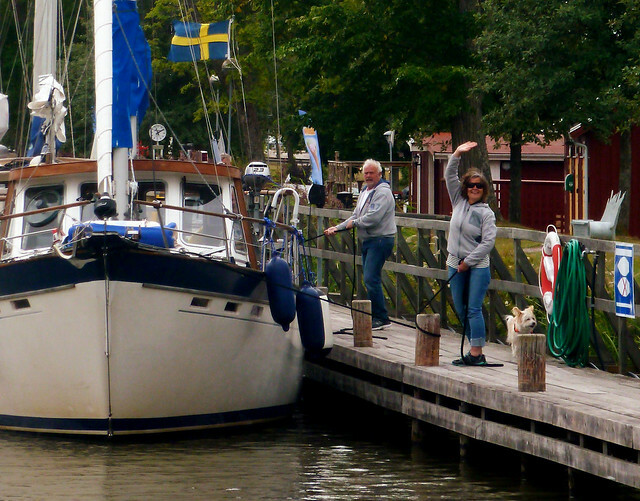 The next day we crossed Lake Vänern and entered the Trollhätte Canal. We had made good time crossing the lake, so we began the journey down the canal, passing through one lock and then continuing to the city of Trollhätten, where we found a tie-up for the night. Below: A park area at Trollhätten, with older canal sections preserved for historical interest. 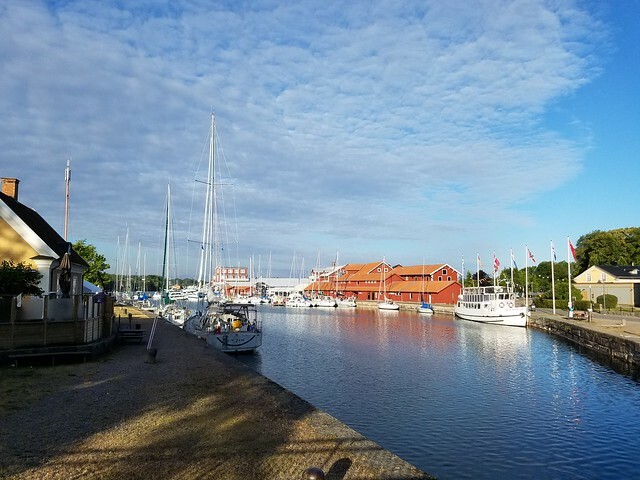 This canal is quite different from the Göta Canal - for one thing, there is still commercial cargo traffic in the Trollhätte Canal, not just pleasure boats and passenger tours as in the Göta Canal. So the locks are bigger and the canal is wider. 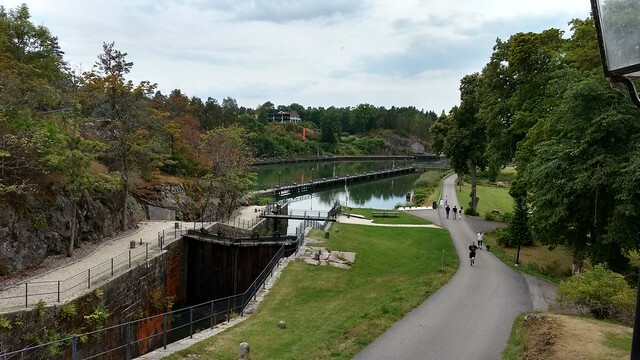 At the City of Trollhätten, they have preserved sections of predecessor canals - the original locks were built in 1800, there were 1830-ish locks that are much like the Göta Canal's locks, and there are, of course, the most modern 1918 locks. The next morning we prepared to lock through the remaining big locks of the Trollhätte Canal. The locks open for pleasure boats at 9 am, but they insisted on waiting until about 9:40 so that three other sailboats could catch up and go through the lock with us. The rain started at 9 am on the dot, and continued unrelenting for the next four hours. 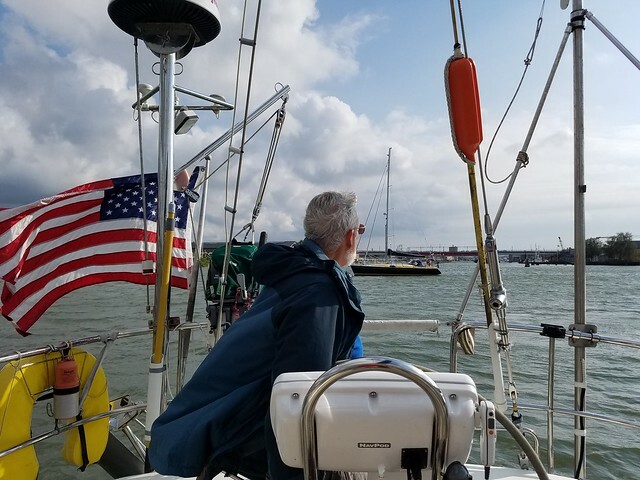 I will tell you that when you are handling sopping wet lines through four lockages, the best foul weather gear in the world will not keep the water from running down your sleeves (as you reach up to grab a line) and then across the back of your neck. We should have been wearing wet suits! Above: Waiting for a bridge opening as we neared Göteborg. But here we are, in a very friendly place. The third boat this summer we've seen with an American flag is across the dock from us (a Swedish/American dual citizen who lives here but chooses to fly his American flag). We've had interesting conversations with him about politics, boats and cruising. A number of other people have come by with friendly greetings. Above: Two American flags at once! 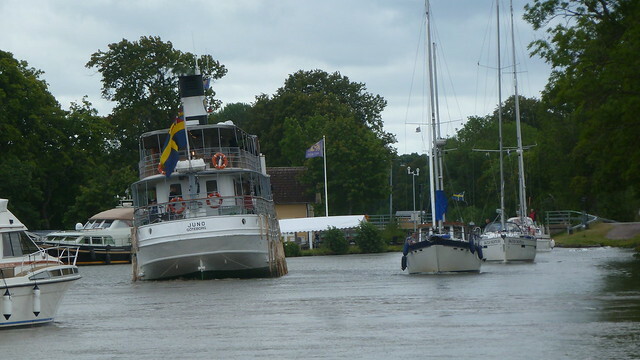 Sequoia on the left, and the Swedish-American boat on the right. Today begins repair work on a few equipment problems as well as the planning and preparations to put the boat up on the hard for the winter. In between time we hope to find a few hours to see Göteborg and our former exchange student, Henrik who lives near here with his family. Click here to see more photos from the Göta and Trollhätte canals.